서울의 기후는 남부지방의 난대성 기후와 북부지방의 냉대성 기후의 중간적 성격을 나타내어 비교적 사계절이 뚜렷하고 연간 기온차가 크며, 삼한사온의 대륙성 기상현상을 보인다. 2005년 서울시 26개소의 자동기상관측망에서 관찰한 계절별 수평기온분포는 도심지로 갈수록 기온이 높고 교외로 갈수록 낮으며, 특히 영등포, 양천 등 서부지역과 마포, 동대문 등 북부지역, 서초, 강남 등 남부지역에서 기온이 높게 나타나고 있다. 이러한 고온지역의 분포는 도시열섬효과의 결과이며, 고층건물 증가, 도로포장 증가, 녹지대 감소 등 토양피복 변화와 밀접한 관련이 있다. As Seoul’s climate lies between subtropical climate of the Southern region and subpolar climate of the Northern region, it has four distinct seasons, and wide annual range of a temperature. It also shows the continental climate of three cold days followed by four warm days. 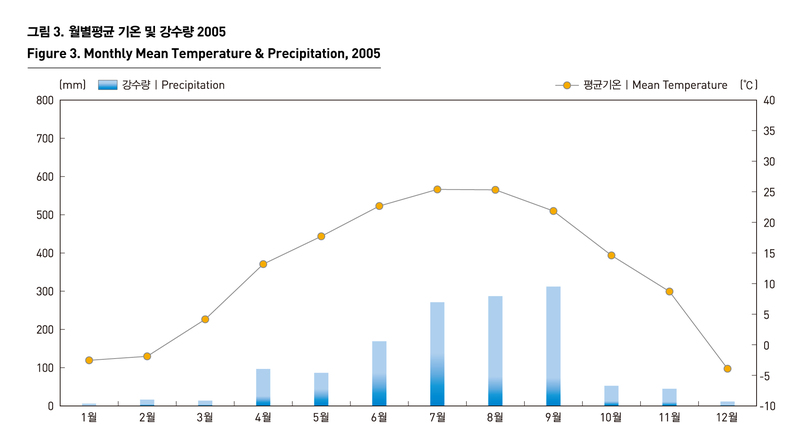 According to 2005 horizontal temperature distribution by season observed in 26 Automatic Weather Stations(AWS) in Seoul, the temperature goes up in the downtown, and goes down in the outskirts. 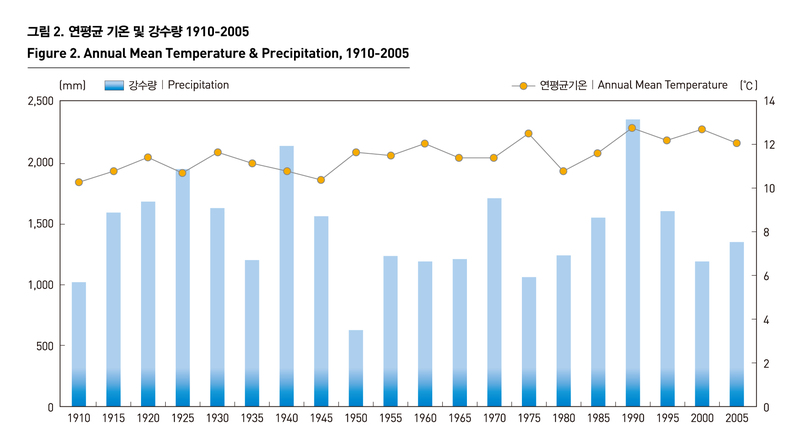 In particular, the temperature is remarkably high in western regions such as Yeongdeungpo and Yangcheon, northern regions such as Mapo and Dongdaemun, and southern regions such as Seocho and Gangnam. 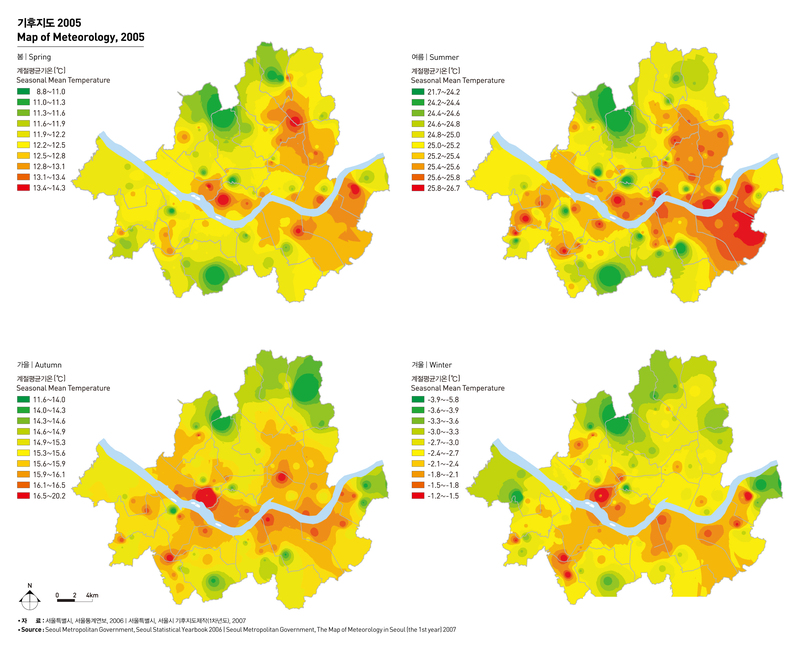 This is attributable to the urban heat island effects, and is closely related with increasing high-rise buildings and paved roads as well as reduced green zones.